Toshikazu Shiozawa (塩沢 敏一, Shiozawa Toshikazu, January 28, 1954 – May 10, 2000), better known by the stage name Kaneto Shiozawa (塩沢 兼人, Shiozawa Kaneto), was a Japanese voice actor from Tokyo. At the time of his death, he was attached to Aoni Production. He had a distinctive calm, aristocratic-sounding voice, which often typecast him as villainous or anti-heroic strategists and intellectuals. His stage name originated from the Japanese director Kaneto Shindō. Shiozawa graduated from Nihon University Second Senior High School, where he learned to perform in its art department. On May 9, 2000, at 4pm, Shiozawa fell down the stairs of his home in Shinjuku, Tokyo. Despite claiming that he was “alright”, Shiozawa fell unconscious and was rushed to the Tokyo Medical University Hospital; he died of a cerebral contusion at 12am on May 10, at the age of 46. Fellow voice actor Hidekatsu Shibata was one of the attendees at his funeral. 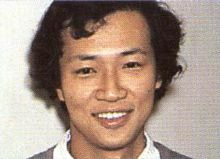 Shiozawa's ongoing roles were replaced with other voice actors after his death. Hikaru Midorikawa said, "Kaneto Shiozawa was my hero." 1985 Megazone 23 - Part I as B.D. 1986 Megazone 23 - Part II as B.D. ^ NEC Avenue. Strider Hiryu. PC Engine. Level/area: Ending. ^ "ローズ". Fox Japan. Retrieved March 3, 2019.